Slate marker with name and dates scratched in it. Broken slate rock with name and date scratched in it and a CSA metal marker beside it. A slate rock marker that is broken and has no dates, only the name scratched on it. 34386487, Who was killed in action July 27, 1944 in the vicinity of Saint Jean France. His company was in the attack advancing in a dodge row when an enemy machine gun opened up and fired upon the squad of which he was a member. It was at this time that Ernest was hit by machine gun fire and killed instantly. Marker is broken. Unable to read dates. Can only read his name and that he was about 47 yrs old. w/o James Marion Starnes. Marker is broken. w/o Evan Nelson "Bud" Threatt, d/o Lee & Dennie & Dennie Stacks Osborne Her name is spelled "Deanie" on the marker, but is spelled "Dennie" on the death certificate. d/o A. R. & M. A. (Unknown last name), the marker is a small rectangle in the ground with no other information. d/o Phillip Whitley, Marker is hand made from slate stone and name & dates scratched in the stone. s/o Phillip Whitley, Marker is hand made from slate stone and name & dates scratched in the stone. The Heritage of Union County, North Carolina, 1842-2004, Vol. II: Resided in Union Co, NC where he worked as a carpenter prior to enlisting in Union Co. Feb. 3, 1862 at the age of 34. Mustered in as Private. Promoted to Corporal on an unknown date. Promoted to Sergeant prior to July 1, 1862. Present or accounted for until Sept-Oct. 1864, when he was reported absent wounded. Place and date wounded not reported. Returned to duty in Nov.-Dec. 1864. Present or accounted for until wounded in the right leg near Petersburg, VA, April 2, 1865. Hospitalized at Petersburg where he was captured on April 3, 1865. He escaped on May 6, 1865 and was captured at Jackson Hospital, Richmond, VA., May 28, 1865. 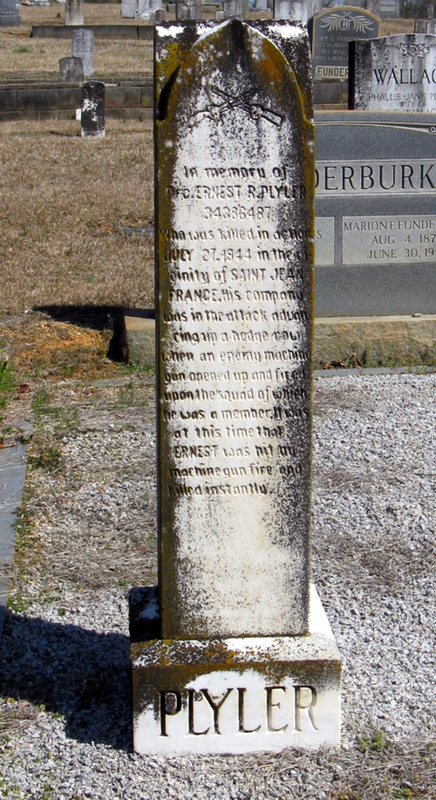 He died in 1902 and is buried at Liberty Hill Baptist Church Cemetery, Union County. [Liberty Hill Baptist Church is located in Pageland Chesterfield Co. SC, not in Union Co. NC].